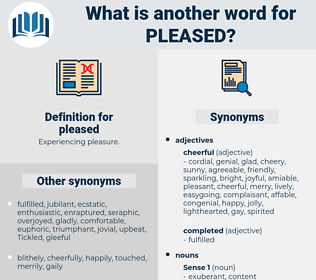 What is another word for pleased? happiest, glad, gratified, contented, happy. grateful, pleasing, excited, thankful, fortunate, appreciative, encouraged, pleasant, unhappy, content, ecstatic, satisfying, enchanted, complacent, lucky, honoured, commends, felicitous, Congratulating, charmed, enjoyable, positive, wonderful, fulfilled, fond, heartening, Commended, keen, successful, interested. let, liked, Responded, addressed, appreciated, Appealed, accepted, You, Enjoyed, Enjoying, Complied, Passed, Catered, Wanna, intended, IIKE, heard, wanted, dig, Rained, Carried, Meant, Met, thought, enchanted, fulfilled. disappointed, Praised, hailed, Appraised, Congratulated, realised, advertised, blessed, preferred, amused, happiness, Persuaded, Caused, stolen, placed, liked, disposed, used, compensated, accomplished, complimented, Responded, demonstrated, me, Inserted, invited, evaluated, Assessed, addressed, appreciated, accepted, played, Accommodated, welcomed, endorsed, Caught, Wished, restricted, settled, Supplied, acknowledged, valued, cooperation, seen, noted, loved, expressed, resolved, left, implemented, Enjoyed, Tickled, situated, unsatisfied, Complied, respected, Hoped, filled, Passed, qualified, arranged, located, Greeted, completed, Catered, estimated, requited, laid, Served, Embraced, Succeeded, paid, realized, observed, confined, seized, positioned, agreed, Benefited, desired, moved, pursued, concluded, missed, adopted, occupied, Delivered, acquired, Been, set, attended, Dealt, comforted, treated, stoked, heartened, Achieved, covered, protected, Provided, gratified, Reached, overjoyed, Deemed, inclined, defined, received, discharged, shared, held, governor, secured, trusted, Undertaken, recognized, ruined, Brought, attained, Lived, granted, found, Relied, Carried, Weighed, pumped, taken, grateful, Met, Viewed, done, made, excited, dissatisfied, thankful, encouraged, enchanted, honoured, Congratulating, charmed, fulfilled, Commended, interested. welcome, dissatisfied, gratifying, proud, comfortable, lovely. downcast, sorry, cheesed off, tired of, woeful, exasperated, dejected, fed up, disconsolate, aggrieved, doleful, disaffected, Malcontented, malcontent, sad, lachrymose, gray, miserable, depressed, humble, dolorous, gloomy, anguished, roiled, unsatisfied, black, abject, frowning, heartsick, glum, peeved, disgusted, unpleased, offended, blue, riled, joyless, mournful, browned off, desolate, melancholy, pained, sick, discontented, steamed, miffed, heartbroken, brokenhearted, sorrowful, dark, discouraged, wretched, stung, disheartened, sick of, downhearted, disgruntled, plaintive, irritated, forlorn, annoyed, despondent, discontent, nettled, dispirited, woebegone. Your father does not look very pleased. You will have them and we will be pleased.